Not Chick’n Noodle Soup & a Hot Toddy! Having been born and raised in Chicago, I know it’s only a matter of time before I catch a cold during the fall or winter. I have made it a point to get a flu shot every year since my oldest niece was born, and I either end up with a really violent flu about two weeks after getting the shot or I am in the clear. I got this season’s flu shot a month ago, so my educated guess is that I will not the flu. However, I cannot escape the cold! It’s not completely unexpected: I was the one idiot in Chicago who wasn’t wearing socks while walking outside yesterday. And then, today, when I couldn’t concentrate and was trying to stay awake at work, I came up with the genius idea to get some fresh air — in the balmy 43 degree weather. The point is, I feel like total poop right now. I’m sneezing, my nose is running, I’m chilly and achy (uh oh, I hope my flu theory doesn’t get debunked), and I’m exhausted. My body absolutely wants to shut down. My appetite has also been measly all day, but I had to eat something, so I made a really basic Not Chick’n Noodle Soup for dinner. 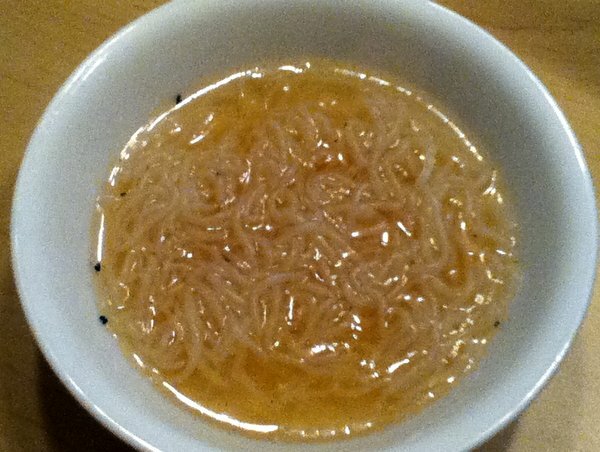 I put the water and bouillon in a medium sized pot and let it sit while I drained and rinsed the noodles. I started heating the water and this helped to fully dissolve the bouillon cube. Once it was boiling, I added the noodles, brought it back to a boil and let it cook for about 3 minutes. This is actually the first time I tried Shirataki noodles! I liked them a lot and I love that the traditional version, made with white yam, is soy-free and has zero calories (along with being gluten-free and vegan). You can definitely add more to this, but I was really in need of a bare bones broth and noodle dish with little embellishment. I was worried that it would be bland, but it was perfect as-is with just a tiny bit of salt and pepper. Before going to bed, I definitely wanted to warm up with some hot tea. Why not add some spirit to the mix? I didn’t have whiskey so I used rum for this particular hot toddy. I started with a cup of hot ginger water, but you can start with any tea. I added some agave nectar to sweeten it, and then added just about a tbsp of rum. That isn’t a lot of rum, but I wanted to be pleasantly relaxed, not buzzed.